When looking for a luxury living experience in South Beach, sometimes it is hard to find a luxury condominium that breaks the mold of major developers in the area. The Apogee on South Beach has distinguished itself as the leader in South Beach luxury. With its instantly recognizable, Asian-inspired architecture and design, the Apogee was built with attention to every single detail imaginable. This 22-story beauty offers some of the most spacious living areas in Miami and is home to only 67 units. Designed by industry veterans Sieger-Suarez Architects and Yabu Pushelberg, it is no secret why Apogee is regarded as the very best in ultra-luxury living. Located at 800 South Pointe Drive, at the Southern tip of Miami Beach, Apogee gives exclusive 360-degree views of the beautiful Atlantic Ocean, Intercostal Waterway, and Miami skyline. Literally everywhere you are at Apogee South Beach, you will be surrounded with beauty. Three and four bedroom units are currently available, with three bedroom 3,103 square foot models starting at $7.95M up to four bedroom 4,154 square foot models selling for $16.5M. As you would expect, the flawless design scheme and location of Apogee South Beach luxury residences comes standard with the very best in interior design and features. Ten-foot ceilings offer cavernous living spaces and assist in natural light entry and seamless transition to outdoor spaces. Every unit at Apogee South Beach comes with an 11-foot wide terrace complete with summer kitchens with plenty of room for outdoor lounging, cooking, dining, and entertainment. An AMX smart panel is pre-wired into every home for instant access to building services like valet, spa, concierge, and security. Kitchens come standard with Dellacasa kitchen cabinetry and the finest appliances on the market. Master bathrooms come with midnight kitchens, gas fireplaces, and attached master bathrooms with his and hers vanities and showers. 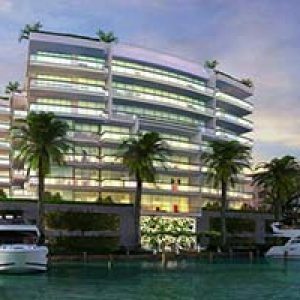 Apogee South Beach luxury residences was constructed using double slab technology between floor to reduce noise. Security and entry is provided by keyless bio-metric fingerprint locks. In addition to the highest standards in design and luxury inside of your residence, Apogee South Beach offers incredible amenities for all community members. The beautiful main entrance lobby is reserved only for residents and their guests and will be sure to impress those with the highest standards. A state-of-the-art fitness center and spa is available without limits to all employees. An outdoor party pavilion gives you plenty of room to host catered affair while overlooking some of the most beautiful vistas in South Florida. In case luxury living at Apogee South Beach isn’t enough, you’ll be just steps from the world-class dining, entertainment, and cultural experiences South Beach is so well-known for. Dodge Island, Fisher Island, and Virginia Key are all within eyeshot from your beautiful terrace. Visit the Miami Seaquarium, or catch a Miami Heat basketball game at American Airlines Arena. The Apogee South Beach is truly the gold standard in South Florida ultra-luxury living. Don’t miss out on this opportunity to own a piece of iconic Miami Beach real estate!